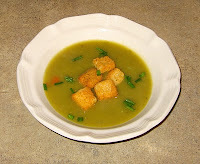 My favorite food blogger recently did a post on Split Pea soup, and I was inspired to try it. Yes, that's right, much to The Pit's shock, I had never before tried Split Pea soup. This is partly because I'm not usually partial to foods that are almost completely liquid, and partly because most Split Pea recipes I've seen have included ham hocks. I don't like ham, and in point of fact, don't really even know what a ham hock is* or what it looks like. *The Pit clarified that it's some sort of smoked ham bone. It sounds even less delicious with that description, although I direct you to the wikipedia page to see for yourself. Anyway, I decided to omit the ham, simplify the recipe a bit, and hope for the best. With The Pit's optimistic encouragement, I actually used my biggest pot to make a giant amount of soup. Luckily, it turned out great, especially on the second day we had it, after sitting in the fridge overnight. And the best part? Without the meat, it cost approximately $4 to make (with half of that cost coming from the croutons). Of course, the downside of no meat was that the soup alone wasn't super filling. I made this Rosemary Bread to go along with it, and I would suggest a big salad too. 1) Pour the split peas into a colander, pick out any stones, and then rinse the peas. Fill your largest pot with water, and dump in the clean peas. Bring to a boil. 2) While the peas get boiling, dice the carrot, celery, and onion in small pieces. Peel the garlic cloves and cut off the hard 'foot' on each one. 3) When the peas come to a boil, a greenish scum will rise to the surface...skim this off for a few minutes, until the soup is relatively clear. Add the diced vegetables and the garlic cloves, and continue to boil for several minutes. 4) Season with salt, pepper, bay leaves, thyme, and parsley, and lower the heat to a gentle simmer. Cover the pot loosely, and let it simmer for about an hour. 5) Peel and dice the potato, and add to the soup after it's been simmering for about an hour. Bring to a boil for a few minutes, then reduce the heat again and allow to simmer for at least another 20 minutes. 6) At this point you have several options. If you like chunks of stuff in your soup, you can pretty much eat it as is. Otherwise, you can use a regular* or immersion blender to make a smoother consistency. If you're too lazy to use the blender, but have another hour of time on your hands, continue to simmer the soup until it's smooth and thick. * If using a regular blender, don't fill the blender up too high, work in batches, and hold the lid down carefully when blending -- I got impatient with our tiny blender, filled it too high, and ended up with hot soup all over one side of the refrigerator. 7) Serve with the croutons, and garnish with diced parsley or chives if you have any laying around. There should be plenty of left-overs, which is excellent, because as I found out, the soup only gets better on the second day.